combination of luxury with maximum functionality, will soon become a mainstay on Europe's roads. "The Setra TopClass 500 is another guarantee for the location's secure future. 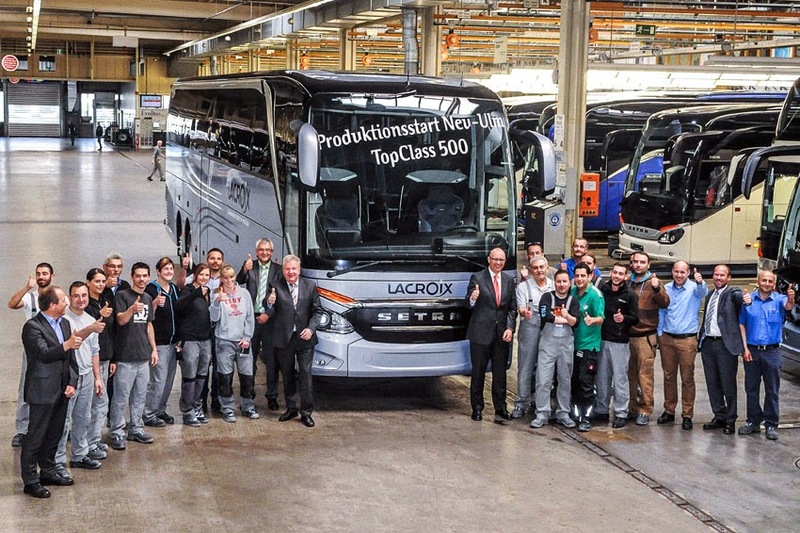 At this plant we produce an extremely varied lineup of vehicles, ranging from functional regular-service city buses to top-of-the-line premium-class travel coaches," said Dr. Holger Steindorf, Head of Production at Daimler Buses. "All of the employees at the plant have worked extremely hard to make this day happen and prepared themselves for the new production processes. This shows that we have a very motivated and highly qualified team whose members are extremely committed to their work." Jochen Duppui, Head of the Neu-Ulm Assembly Plant, added, "The decades-long history of Setra buses, the very experienced and dedicated production team, and the direct proximity to the bus development center and the brand sales unit provide us with ideal conditions for further enhancing the success of high-quality Setra travel coaches."